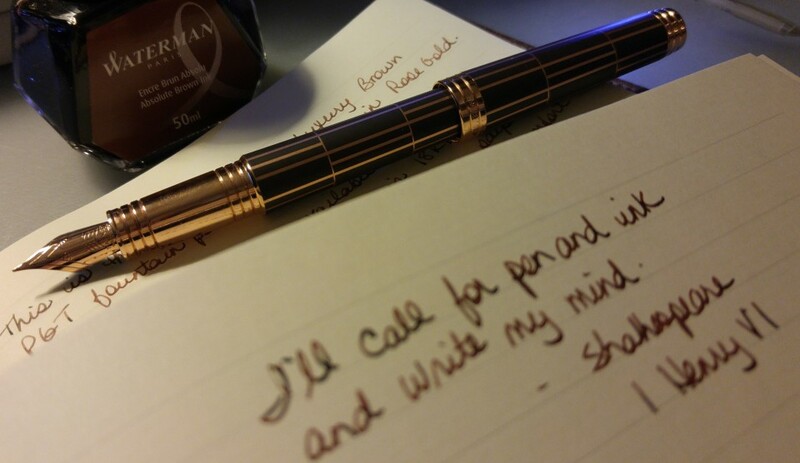 This week I’ve been using some different pens at work, which inspired me to think about doing a whole post about the pros and cons of fountain pens as work pens, the limitations of office paper, the mechanics of ink bottles and keyboards. It’s taking shape in my mind so maybe it will turn into a post. I will announce the pen for April on March 30. Work has been a little frustrating of late, so I’m trying to work through that. Journaling helps so much. Any patience I’m able to show to the world stems from my journal, where the real me is allowed to rant and rave and stamp my feet in fury. At least figuratively. Sometimes it’s the only thing that keeps me sane. We submitted our taxes for this year and we are getting a small refund. Yay! We usually put any refund towards a trip but we won’t be travelling for fun for awhile so we had to come up with other ways to spend it. Surprisingly easy to do so! Exciting news from williamhannah.com: Mr. David Round graciously offered me a discount on one of their amazing notebooks for me to reivew. I ordered it yesterday and I’m so excited to share my thoughts on it with all of you. Post to come when it arrives. Completely agree with you, except that not only journaling but all kinds of writing keep me sane. If I didn’t have words, I would be the most hated person of my family.